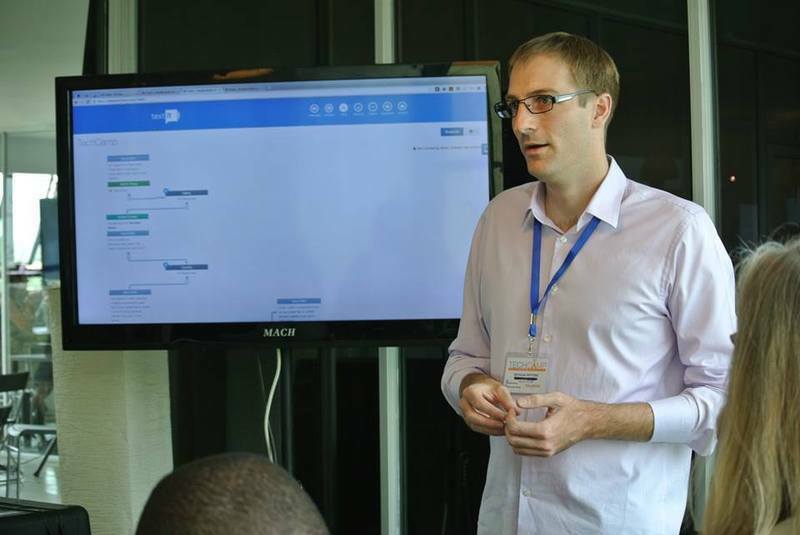 We had the honor of being one of the trainers for the TechCamp Kenya conference on September 9th and 10th in Nairobi. TechCamp's are organized by USAID and are incredibly neat because they are so hands on and relevant. Instead of picking a theme themselves, the organizers query the aid organizations in a particular area asking them what they want to hear about. From that they put together a list of topics and then seek out subject matter experts to help train and organize the participants. This TechCamp was focused on health and we were lucky enough to be invited to train on SMS technologies. I say lucky because it is always inspiring to see the work others are doing, both in very large organizations and very very small ones. TechCamp's format means we were always working in small groups, really talking about the problems they faced and helping us better understand the needs and realities on the ground. Perhaps the most rewarding part for us was seeing the reception to TextIt. Though we have large customers using TextIt now, it is great to see smaller organizations see the potential and talk about how they can use our low cost tool to help them achieve their goals. 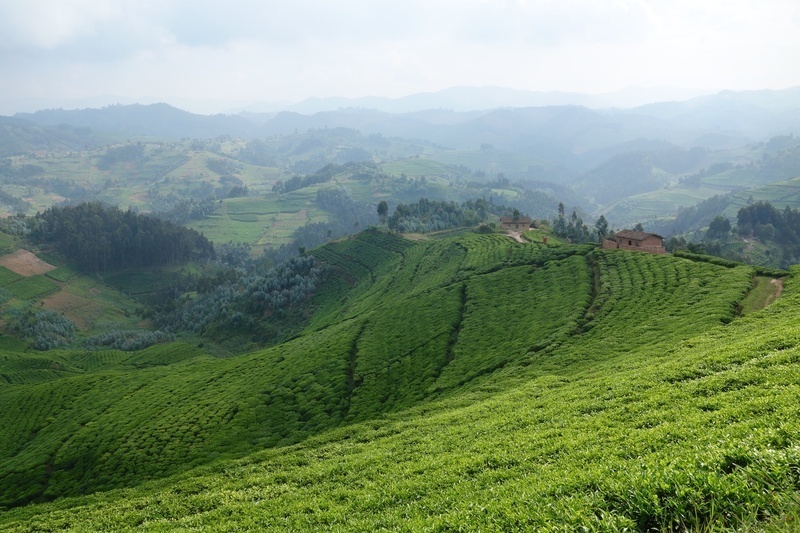 We also got to share our experiences in building other SMS systems in East Africa, both good and bad and generally just had a lot of fun meeting others in the ICT4D community. If you a TechCamp comes to your part of the world, I would encourage you to attend. They are fantastically organized and they are a fantastic way to see how others are solving problems and share your own experience. We're already looking forward to the next one. 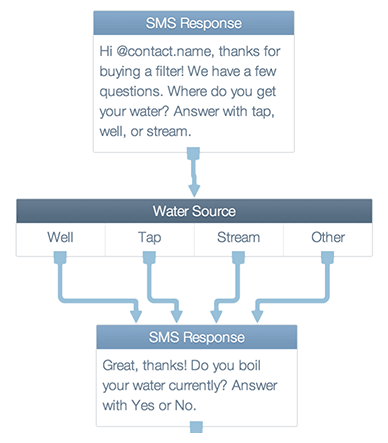 One of the most popular (and best) uses for TextIt is to build multiple question surveys. SMS Surveys have much higher completion rates than those done over email and are usually completed much faster as well. But while most people won't mind answering a few questions, there are a few simple things you can do to increase the odds of getting great response rates. 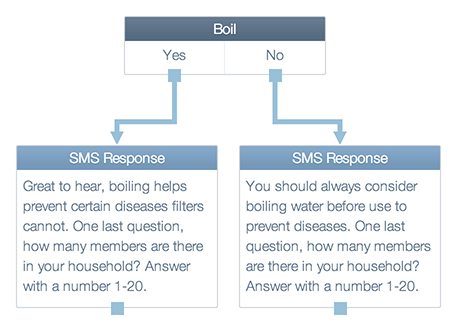 Here are some tips to make your SMS surveys as effective as possible. Even if you have communicated to your users via SMS before, it is always good to remind them who you are in case they haven't saved you to their address book. As always, keep it short, just add your organization name to your greeting. Leading with something simple like "Hi from TextIt!" can go a long way. Try to keep your questions clear and as short as possible. Though all handsets support messages as long as 160 letters, many do not display more than the first 50 or 60 without scrolling. Try your best to put your question in those first characters so your users know they are expected to respond and know to scroll down. Along the same lines, don't get greedy with your survey, keep it to a manageable number of questions. Ideally try to keep your survey under five questions, though depending on the audience you may be able to ask up to ten effectively. You'll need to test this out yourself, but make an effort to think of what the critical indicators you want to collect are and stick to those. If you absolutely must ask more questions, then try to split them among multiple surveys asked over a longer period of time. Nobody wants to feel like they are talking with a robot, so do everything you can to make the survey feel personalized and fun. If you know the names of your users, use TextIt's variable substitution feature to include it in your greeting, after all, everybody likes hearing their name. Even if you don't, personalize how you pose questions based on previous answers. 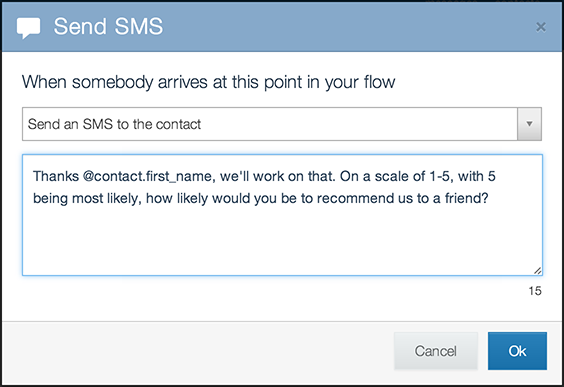 This will make your users feel like they are being listened to and help them stay motivated to complete you survey. Unless you are asking an open ended question, you should give your users some clues on how you want them to answer. If you are asking a Yes or No question, end your question with "Answer with Yes or No". This removes one point of friction for your users, they don't need to ponder what formats are supported and it also reduces the chance of them receiving an error because they answered with something unexpected. Of course, even if you provide great prompts you'll still want to support synonyms and provide helpful error messages. 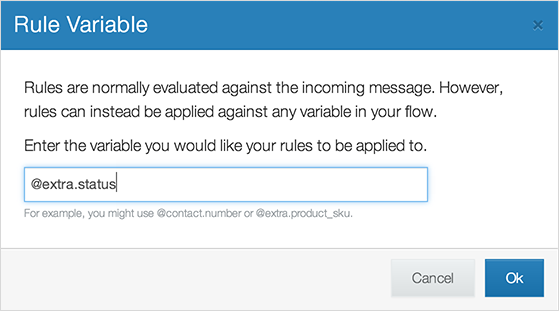 If possible, make answering free to your end users. In most countries you can configure a SIM card to be reverse billed, that is, you would pay for the incoming response instead of your users. This is especially important in developing contexts where the cost of responses over a long survey can add up. Sometimes it is tricky finding the right person at a carrier to set this up properly, but it is almost always possible. 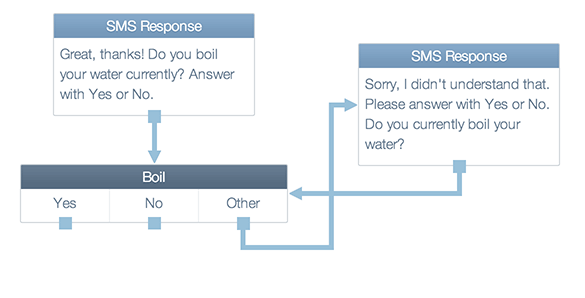 Oh and once you have this set up don't forget to tell your users that responding is free! Can't make responding free? Then set up some kind of reward for your users. This can be something that has real monetary value, like a coupon you send them upon completion or can be something fun like a quote, joke or motivational message. Another idea is to enter anybody who completes your survey into a drawing to win something. Be creative, there are lots of different ways of motivating users! Think about what your users are going to be doing when they receive your survey and use that to your advantage. If you send them a question while they are asleep or having dinner, they might not see it or forget about it entirely. The "right" time to send out a survey is different for every audience, but with a little thought your messages will hit them right when they are most receptive. Treat your users with respect: allow them to opt out of future surveys and don't send surveys too often. This is especially important in more developed markets which have regulations about how you can contact your users. 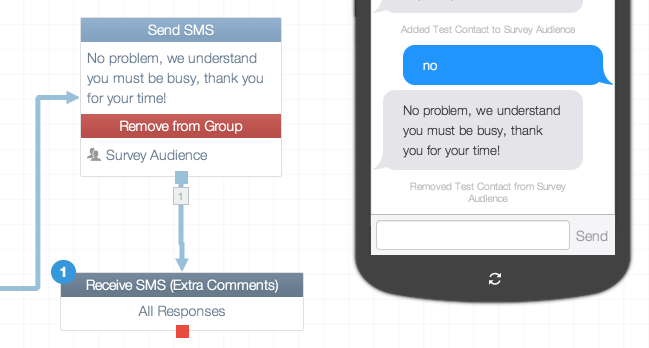 Follow the general guideline of only contacting users who you have a relationship with and respecting their wishes if they choose not to participate, TextIt makes it easy to manage groups in flows to do just that. Most importantly, keep experimenting! Every audience and context is different, and your users' tastes may even change over time. Experiment and keep track of how many users finish your surveys and keep iterating based on those learnings. There is no catch all solution, but if you make an effort you'll have amazing response rates in no time. We pushed a few new things this week based on your feedback, including allowing you to start flows on set schedules (even repeat them!) and a new video learning center with short two minutes videos covering various aspects of flows. 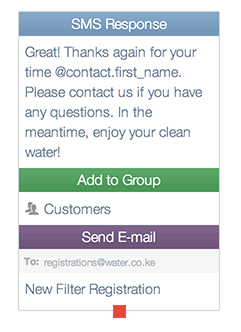 One request we got from a few people is whether you could trigger flows based on time, that is send a flow to a set of contacts every Monday at 6:00pm. And you know what? That's not just good idea, that's a great one, so we slaved away this week to bring it to fruition. Just visit the Triggers Tab and you can start triggering flows based on whatever schedule your heart desires. This gives you a lot of power, you can now send out weekly questionnaires to a set of contacts automatically, say to do a longitudinal study of their satisfaction or the effect of your program over time. Or you could utilize schedules to gather stock levels at clinics without having to worry about your contacts remembering to send it. You probably thought that with my voice over skills I would have hung up the hat doing tutorial videos, but I just can't resist, so we put together a dozen really short videos covering basic (and not so basic) flow concepts to help you get started. If you want to see how to use some of the more advanced actions in flows, or if you are just feeling lonely, you can check them out in our new learning center. As always, get in touch at feedback@textit.in if you have any questions or suggestions.